The sickest thing about the Trump era isn’t Donald Trump himself, but the way the Republican Party has completely corrupted itself to be his servant. The media love to highlight Republican Never Trumpers, and there are many in the pundit class. But not in the politician class. Out of nearly 300 Republican legislators in Washington, exactly one has been courageous enough to call Trump the shyster he so obviously is: Arizona Sen. Jeff Flake. But he’s wimping out by retiring. On the other side, the competition for Best Supporting Actor for the Man Who Lies Every Time He Speaks is intense. You’d have to rate Mike Pence high, but nobody cares what the vice president says or does—any VP, but especially this one. Paul Ryan is way up there, if only for that single sycophantic adjective “exquisite” (applied to Trump’s “leadership”) after they enacted the tax bill. But I think it’s clear that the Oscar goes to Devin Nunes, because his corruption has consequences. The chairman of the House Intelligence Committee has a serious job. It’s a panel that has existed for nearly half a century, and it came into being to safeguard the republic against abuses of power by intelligence agencies. If you’ve never heard of Otis Pike, the Democratic congressman from Long Island, go Google him. He was exactly what a legislator in a democracy was supposed to be. The founding mission of the House and Senate intel committees was to protect American citizens against abuses of power by intelligence agencies. That’s a noble goal; the kind of thing the government exists to do. Nunes has corrupted that mission completely. He’s changed it from “citizens” to “citizen,” because his intelligence committee is in the business of protecting one citizen: Trump. In January, he pushed out the release of a memo that was obviously designed to shield Trump and that totally broke committee tradition and protocol. Then last Friday, his committee released its final report on the collusion question, and guess what? It found no evidence of collusion because it chose not to interview anybody who might have had evidence of collusion. On Sunday on Meet the Press, former FBI Director James Comey called the committee report on a “wreck.” “It wrecked the committee, and it damaged relationships with the [U.S. Foreign Intelligence Surveillance Court], the intelligence communities,” he said. 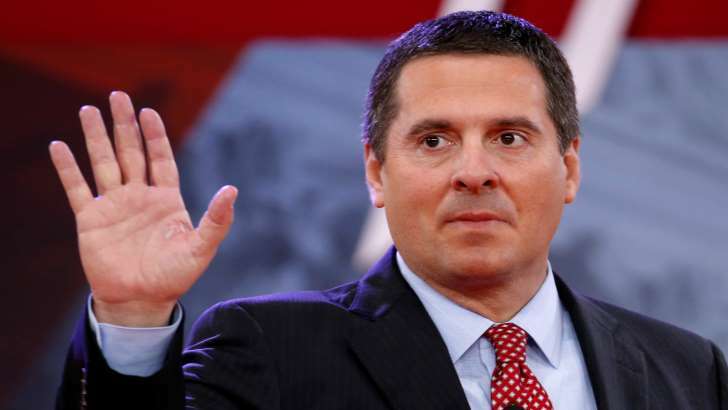 Other former intelligence officials, like John McLaughlin on MSNBC Sunday afternoon, agreed that Nunes has politicized the committee in ways he’d never seen in 40 years. Back in January, McLaughlin, who once ran the CIA, tweeted: “FISA warrants typically are big thick documents, 50-60 pages. If the Nunes memo about one is just 4 pages, you can bet it’s a carefully picked bowl of cherries. Made all the more dishonest by holding back the minority rebuttal memo. A real debate needs both. Someone fears that.” I think we know who that someone is. The same someone Nunes is out to protect. I can’t say exactly what’s motivating the guy. But here’s a little hint. He represents a district in California’s Central Valley that abuts Fresno. The Cook Political Report rates it R+8, which means it’s a pretty Republican district, but not an overwhelmingly safe one. He has a serious Democratic opponent this year, a former prosecutor named Andrew Janz, who has raised $1.4 million in the last year. So there it is. It would be one thing if Nunes chaired the transportation committee. In that case, having sold his soul to Donald Trump wouldn’t really matter. But now, the oversight of the nation’s intelligence agencies is governed by the committee chairman’s ability to raise gobs of right-wing money from people who are out to protect Trump. And that’s why the Oscar goes to Nunes. If there’s one chairmanship in the House of Representatives that’s supposed to be in theory somewhat apolitical, it’s the intel committee. It’s officially called the House Permanent Select Committee on Intelligence, and that word “select” means that the leaders of both parties individually choose the members. In theory, they’re supposed to pick people who have demonstrated in their House career that they’re not totally political animals. John Boehner’s choice of Nunes is one of his worst decisions as speaker. But just as Nunes was “selected,” he can also be unselected any time the speaker wants. Paul Ryan could fire him today. As Mieke Eoyang wrote in Politico recently, Ryan, who is retiring and thus “free” to act with something resembling integrity in his final days, should fire Nunes immediately. She lays out the whole bizarre history of Nunes’ capitulation to Trump, which started during the transition and got really weird when Trump accused Barack Obama of wiretapping him. Ryan won’t do that, of course. He’s too much of a coward to do anything that would unsettle Trump, as he’s proven time and time again. That job will be up to the voters of California’s 22nd Congressional District. Larry Sabato just downgraded the district from “safe” Republican to “likely” Republican. One of the signal glories of the Democrats taking back the House would be seeing Adam Schiff take over the chairmanship of the intel committee, bumping Nunes down to the powerless minority. But it would be even sweeter if Central Valley voters returned him to private life. He’s probably already earned a nice future on Fox News, but at least he couldn’t do any actual harm there.